We offer full technical support of custom enterprise solutions, as well as standard systems based on Google Maps, GE Smallworld, as well as Oracle and Java platforms. We provide remote and on-site support, as well as pro-active system audits and full solution administration. The scope of our service can cover all levels of support: from the 1st line (direct customer service) to the 3rd line of support (fixing general application bugs). Our M&S service covers the whole solution, including customizations. We adjust SLA (Service Level Agreement) conditions to specific customer requirements. As a part of our services, we carry out regular onsite inspections of the system functionality from the administrative point of view. We analyze the performance, availability, as well as maintenance and development of the system functionality. Globema Technical Support Department use well-defined and proven procedures for handling requests. 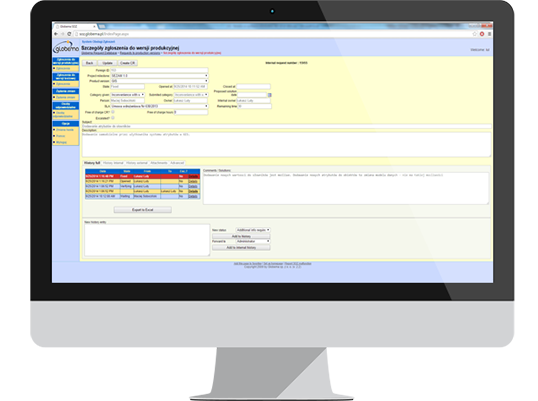 Registering and tracking trouble tickets is easily done within the multi-lingual web application – Globema Customer Support System. Globema has over 15 years of experience in Smallworld systems maintenance & Magik development. During these years we have substantially contributed to the GE Energy’s portfolio of products and are the leading Smallworld partner worldwide. Having over a highly skilled team, including 50 Certified Smallworld™ professionals on-board & a modern, web-based Customer Support System, we are able to provide the highest quality of M&S services to over 50 enterprise Smallworld GIS customers worldwide. We currently handle over 100 maintenance contracts for various platforms for clients in several countries. Service agreements is a process covered by the ISO 9001:2008 certification.